The musings of a card maker!!! My name is Sam and I have been card making since Easter 2006. I love trying new techniques. I especially like stamping and colouring the images with shimmery watercolours, Promarkers and Prisma pencils. I also love using embellishments especially flowers, brads and ribbons. 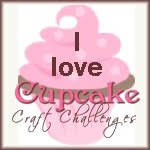 I am on the design team for Creative Craft Challenges. Hope you enjoy my blog. Hello all the cards on here are mine and copyrighted. You can glady use the ideas but you must not sell them and claim them as your own work.